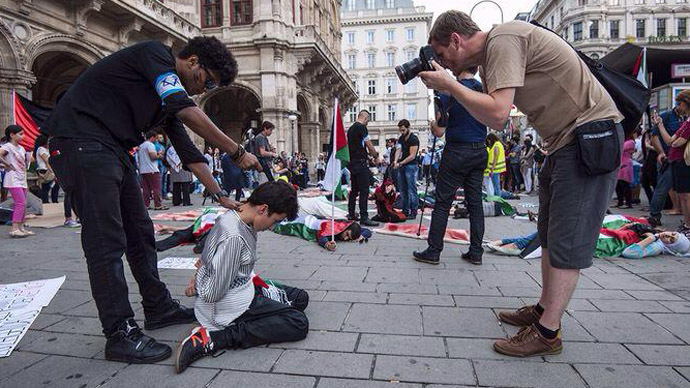 Pro-Palestinian activists in Vienna, Austria, have staged a flash mob in the city center in the form of a theatrical performance devoted to the victims of Israeli operation in the Gaza Strip. 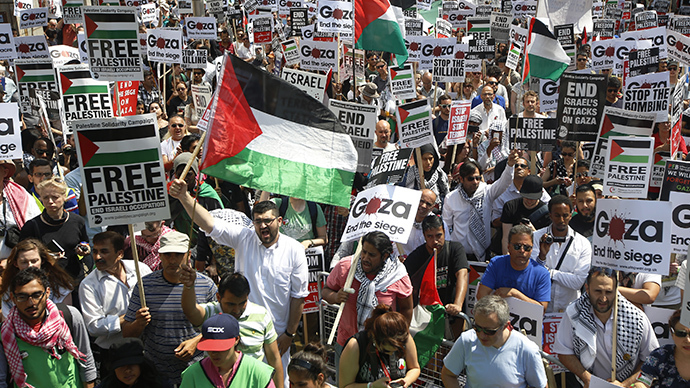 The protest is one in a series of pro-Gaza rallies worldwide. About 35 people staged a theatrical performance in from of Vienna State Opera building late Sunday, reports the APA (Austria Press Agency), leading information provider in the country. The event attracted up to 400 people, according to organizers. The police however, estimated the number at 200 people. The flash mob was launched by the Facebook community ‘Austrian activists for Palestine’. The activists staged a performance, as seen on the photos posted on Facebook by the group. They first presented Palestinian dances. Then people dressed as Israeli soldiers were thrown to the ground by toy guns. After that the protesters fell to the ground and covered themselves with Palestinian flags, representing the victims of Israeli troops. They also staged a representation of one of latest Israeli airstrikes on a Gaza UN school that killed 10 and injured 35, the act that was called by UN chief Ban Ki-moon a "moral outrage and a criminal act." The activists showed a small performance, depicting the school: a Palestinian family was trying to hide but they it was'attacked' by Israeli troops, who prevented Red Cross medics from coming for help. The pro-Gaza protesters accompanied their presentations with the sounds of bomb attacks, street noise and piercing sirens. This is not the first pro-Palestinian rally in the Austrian capital. On July 20, almost 11,000 demonstrators attended a protest in Vienna. The protesters made their way to the historic Hofburg Palace, the official residence of the country’s president. 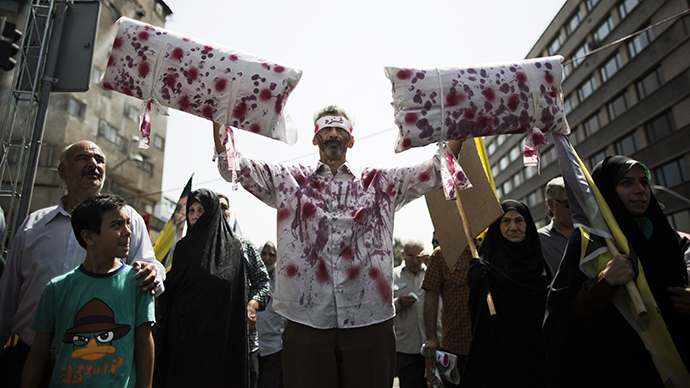 The demonstrators were playing drums and some were carrying bloody sheets wrapped like a dead body or dolls, signs saying ‘Made in Israel’. In the meantime, on Sunday Ban Ki-moon said that Gaza conflict shouldn’t be an excuse for anti-Semitic attacks worldwide. 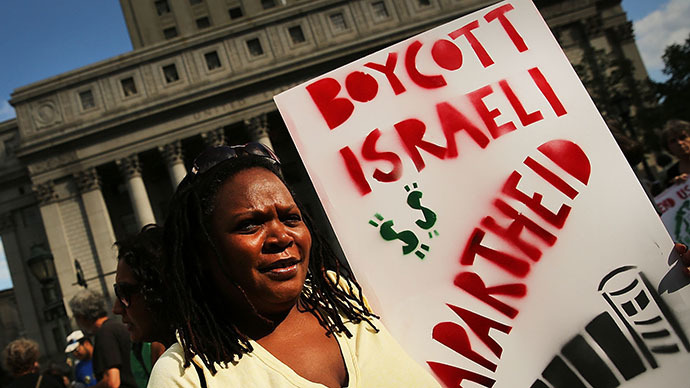 Ban "deplores the recent upsurge in anti-Semitic attacks, particularly in Europe, in connection with protests concerning the escalation of violence in Gaza," read a statement from the UN leader's spokesman. "The secretary-general emphasizes that the conflict in the Middle East must not constitute a pretext for prejudice that could affect social peace and harmony anywhere," it added. Protests demanding an end to Israel's operation in Gaza have been gripping the world for at least two weeks. 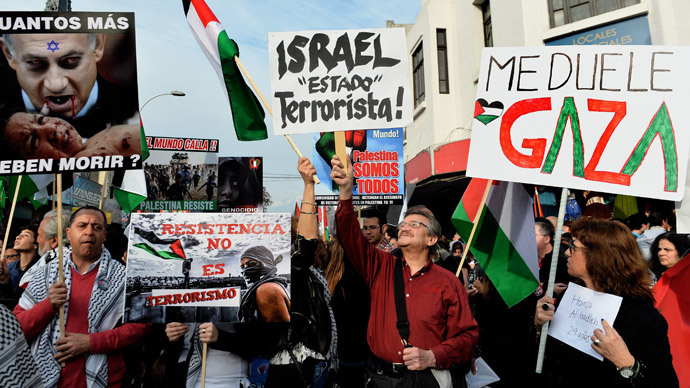 This weekend thousands of people in Australia, France and Chile took to the streets to protest Israel’s military operation in the Gaza Strip. The Palestinian Health Ministry said casualties have reached 1,830 killed and 9,370 wounded so far in Gaza since Israel launched its offensive almost a month ago. The dead include 398 children, 207 women and 74 elderly people, said Dr. Ashraf al-Qedra, a spokesman for the ministry. IDF has lost 64 soldiers in combat. 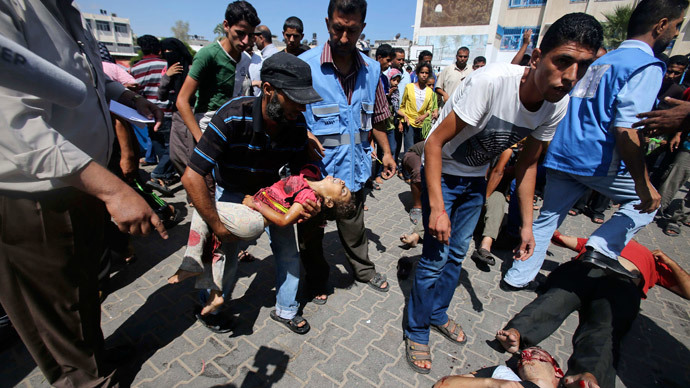 Three civilians were killed by Palestinian rocket attacks on Israel. Amid the growing worldwide protests against the Israeli military campaign in Gaza, Prime Minister Benjamin Netanyahu stated that his government will act “according to our security needs and only according to our security needs” in a speech Saturday.